Jodie Foster runs a futuristic hospital for criminals in Hotel Artemis. And yes, that’s Jeff Goldblum and Zachary Quinto, too. Like many of us, Drew Pearce misses the smaller, high-concept science fiction films of the 1980s like RoboCop and The Terminator. But, instead of just complaining about it, he went out and made one of his own. The film is called Hotel Artemis and it’ll be out June 8. Pearce, best known for co-writing Iron Man 3 and Mission: Impossible - Rogue Nation, wrote and directed the film, which is his feature directorial debut. No, there aren’t any killer robots in it, but it’s a futuristic thriller—set in a hotel for criminals in Los Angeles that’s about to have its worst night ever, with a 65-year-old nurse at the center of it all. Sterlking K. Brown and Sofia Boutella in Hotel Artemis. Despite a “relatively low” indie budget, Hotel Artemis looks pretty damn big, in large part due to its insane cast. Jodie Foster stars as the nurse, leading a cast that also includes Sterling K. Brown, Dave Bautista, Sofia Boutella, Jeff Goldblum, Zachary Quinto, Brian Tyree Henry, and Charlie Day, just to name a few. Drew Pearce on the set of Hotel Artemis. But a movie where an aged-up Foster plays a nurse in a hotel for criminals doesn’t exactly sound like a scifi film, right? Pearce explained he leaned into scifi with Hotel Artemis for two reasons. First, it was practical. To create the right level of tension, the film had to be set in one night. But the characters also had to be injured enough to warrant some stakes and a trip to the hospital. Usually, super injured people are bedridden, but scifi gave Pearce a way around that. “I can’t do a movie set over the course of one night where people are in just total pain and unable to stand up the entire time,” Pearce said. “I need these people to be ready and able to stand up and run around a bit.” So he talked a team of futurists about new or likely future tech we might be using in 10 years that could heal bullet wounds and other traumas much, much faster, to get his characters up and moving in this high-tech hospital. Dave Bautista looks down on the rest of this article. 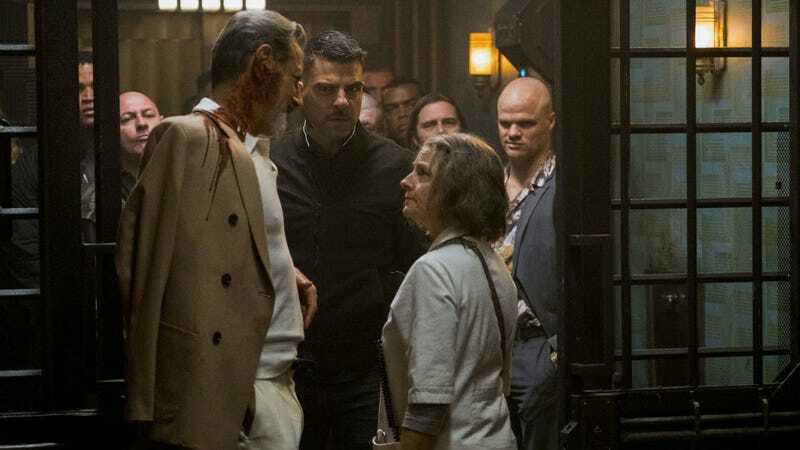 One place Pearce himself didn’t suspend disbelief, though, was in the big picture of Hotel Artemis. Yes, he has a big cast and a high concept story—but this is a smaller movie released during the summer season. The only way he felt it could be its own thing was if he was very, very honest with the film’s intentions and stayed true to his vision. You can see that eccentricity, action, and scifi yourself when Hotel Artemis opens June 8. The U.S. Isn&apos;t Ready For Snarky Superheroes?